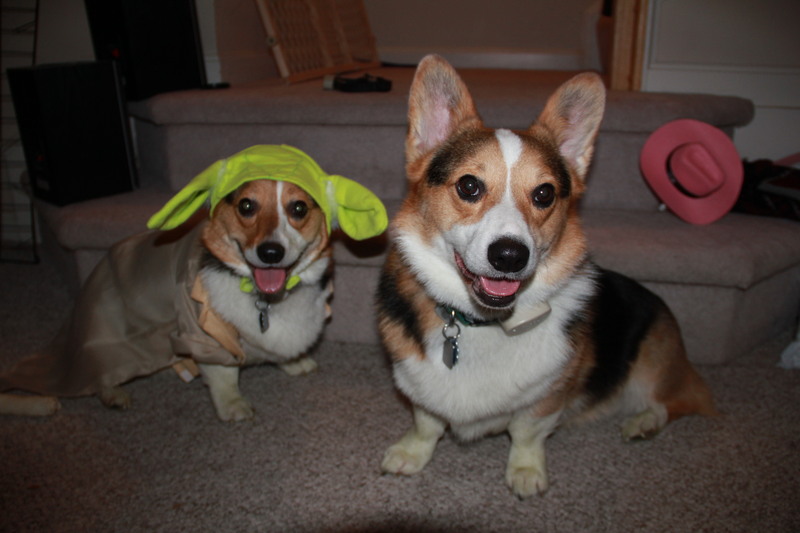 Leia and Yoda here. We are kind of scared, so we decided to write this blog post together. You see, our person has been…acting weird. And who ya calling scared, brother? Let me tell it, Leia. See, our person has been acting weird. She brought home these things. They smelled like corgi toys, but they weren’t to be played with. No, Leia, they weren’t. They were to be… worn. You see, Yoda doesn’t like to wear anything. Whenever I wear a Doritos bag on top of my head, he runs away and hides. Or when I wear a mud scarf around my neck and then get to wear shampoo and water… Anyway, as soon as I saw what our person brought, I knew I wanted to wear it right away. 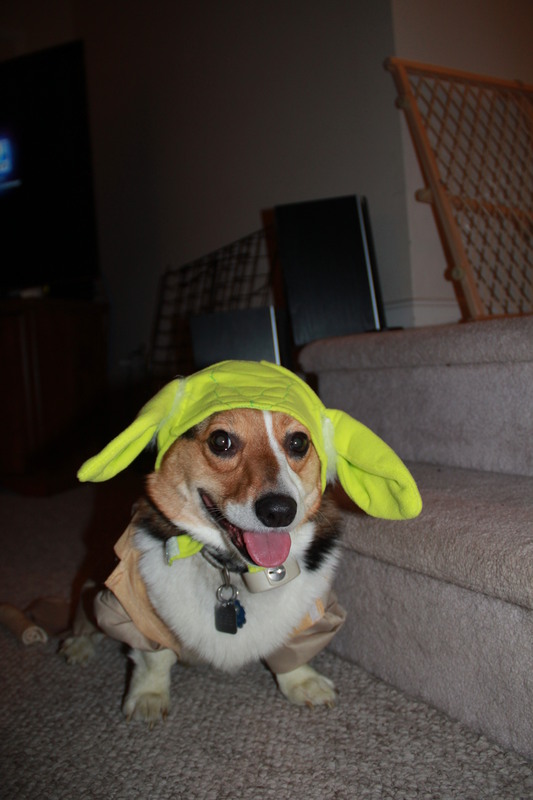 I growled at Yoda so he’d know I was claiming it: I wanted to wear the green costume. Yes, she did. But our person told us that the green costume was for me. But it was too…scary! Yoda, you’re not very smart. That costume is called a Yoda Costume. That’s why you were supposed to wear it. We couldn’t even try to get the coat on you. You were too scared. But not me. I thought it was fun, fun, fun! There’s nothing scarier than my ears being covered. Or knocking on a door? Your reflection in a window? That costume was NOT the scariest thing of all. See how pretty I look in it? Glad you liked it, then. I thought it was pretty scary. But you were jealous, too. You were jealous when our person started taking pictures of me. You wanted to join in the fun. See, here’s a picture of you trying to sneak into MY photo session! But she said if you were gonna be in the picture, you had to be wearing a costume. 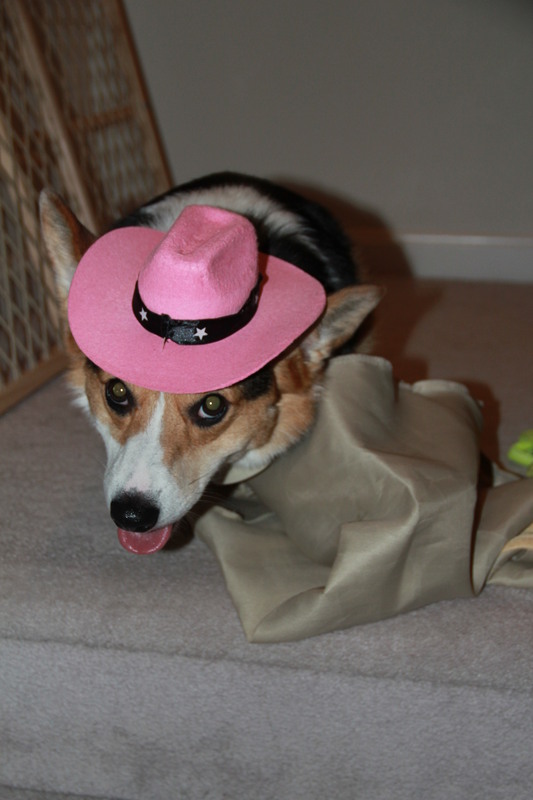 So then she put the cowgirl hat on you. Ha! No. Cow. GIRL. Hat. It was pink. See? Everything i have is pink. My pink skull collar. My leash. So, that hat was supposed to be for me. It’s okay. 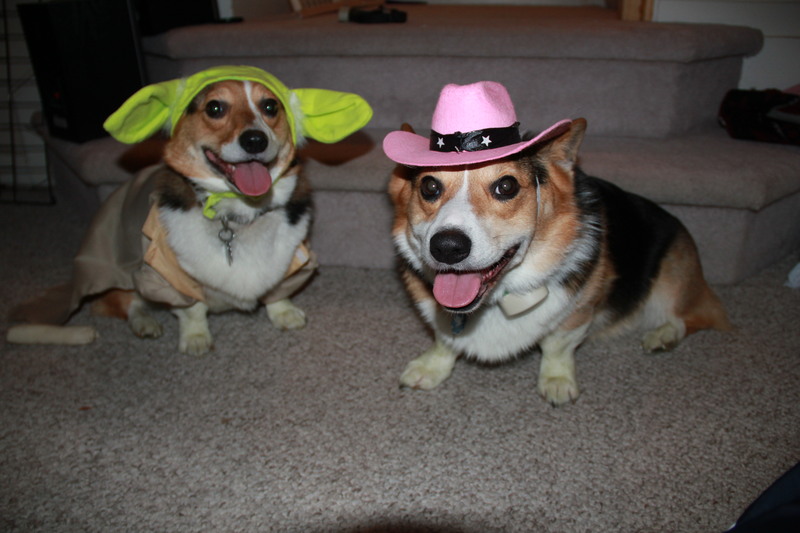 I know that hat is mine just like the Yoda costume is mine, and both our dishes are mine, and all our toys are mine. After all, you were scared of the hat, too. Don’t lie, Yoda. I can see in this picture how you can barely hold your head up. That’s because, um, that hat is, um… heavy. I don’t think so. Your head was drooping like that because you were scared, scared, scared! And then our person started laughing and felt sorry for you. She took off that hat and put that stupid pumpkin shirt on you. At least your ears stood up for the picture, but I know you were scared. When our person told you to sit up on the stairs for the picture, you wouldn’t move. You just sat there frozen, like you couldn’t move in that shirt. I couldn’t! My muscles froze solid. That shirt is haunted. It’s not, Yoda. You’re just a scaredy dog. I can’t believe our person had to LIFT you up onto the stairs while you were wearing that shirt. Well, at least this Howl-o-ween thing is over. And they tear open wrapped gifts. And give you all kinds of new toys that you’re terrified of. No! We have enough of those. Yoda? Yoda, where did you go? Oh, I see. At the mention of “toys,” Yoda has fled the scene. He’s probably hiding in his little house. Ha! While he’s away, here is a picture of him last holiday season. Our people were putting a tree inside our house, and he was watching from a far distance. Fraidy-dog Yoda hiding from the tree, of all things! I was so close, they kept stepping on me. I can’t think of anything more fun, fun, fun! 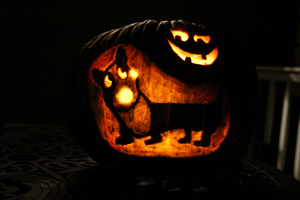 And speaking of scaredy dogs, here is a picture of a corgi-lantern our person made. It’s based on the most cowardly corgi in the universe, aka my brother. 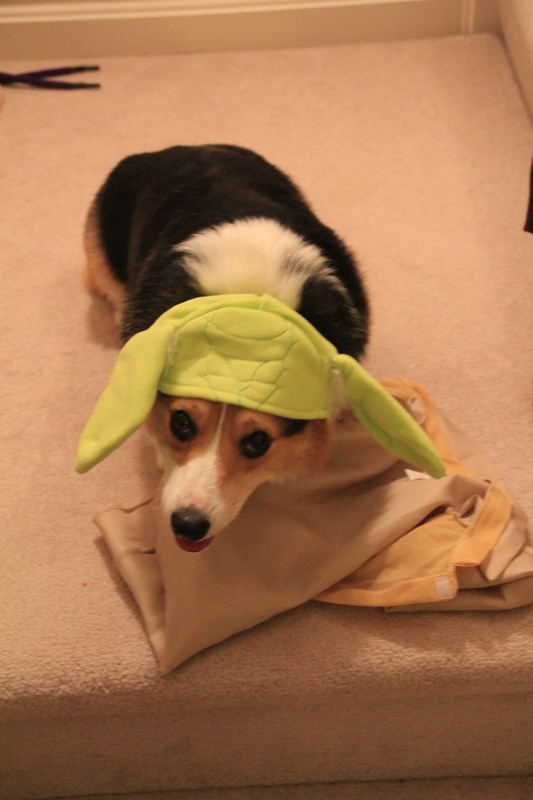 Well, until next time, Leia Corgi signing out. Oh, and remember to send me those peanut butter treats! 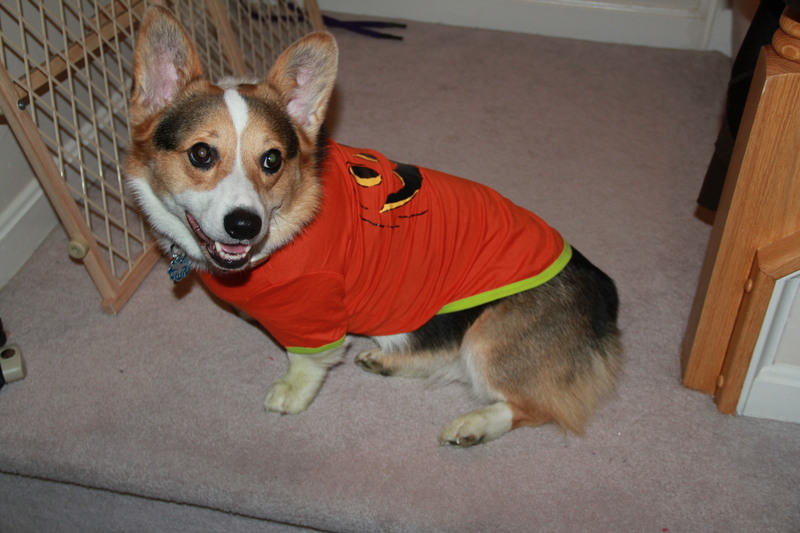 Posted on October 28, 2013, in corgi, corgi capers, holiday, inspiration, photo. Bookmark the permalink. 3 Comments. That little pink hat made my day : ). Thanks for stopping by, Barney! Did you dress up for Halloween, too? Yes, I was a lady bug, I have pictures on my blog. I am a boy but I didn’t mind dressing up as a lady bug though.